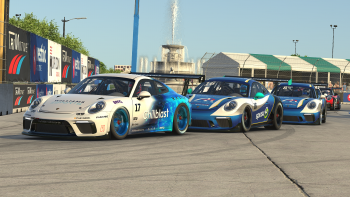 Ryan Luza (#6) made a power move to the lead with three laps to go, passing both Ray Alfalla (#2) and Nickolas Shelton (#12) in the same corner. Even with the setback, Luza had plenty of time to catch the leaders as he was lapping around a tenth quicker per lap. With six laps left Luza had all but eliminated the gap to the leaders, who were running nose to tail with Shelton out front. As the trio came off Turn Two, Shelton got tight which allowed Alfalla to get a run on Shelton. At the same time, Luza also got a run on Alfalla and the leaders were suddenly three wide entering Turn Three. Shelton used the momentum of the top groove to his advantage as he cleared the other two off Turn Four as Alfalla and Luza made slight contact. Despite the contact Luza closed in once again off Turn Two with four laps to go. This time, the run was too big for Alfalla or Shelton to stop as Luza cleared both by the exit of Turn Four. Polesitter Zack Novak (#15) led early, but a sub-optimal pit strategy saw him fade to tenth at the checkers. Luza still had lapped traffic to deal with after taking the lead, but he navigated through it without issue and held off Alfalla by .318 seconds at the checkered flag. Shelton fell to third while Chris Shearburn came from thirty-ninth to finish fourth. Michael Guest rounded out the top five. Vegas saw a few front-runners find trouble early, with Bobby Zalenski getting caught up in Jimmy Mullis’ mess on Lap 16 after Mullis was sent into the wall by Brad Davies. The two spun through the front straight grass but no caution flew as neither car wound up on the racing surface. 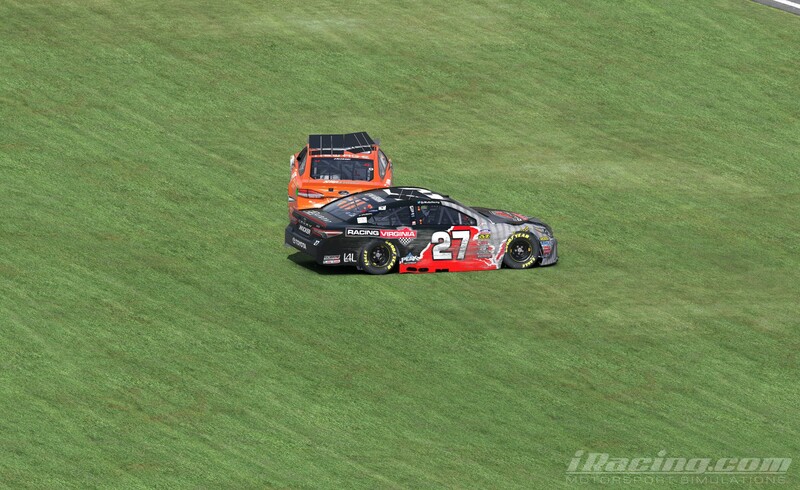 On Lap 52, Keegan Leahy was knocked out of contention while leading after contact with Jarl Teien. 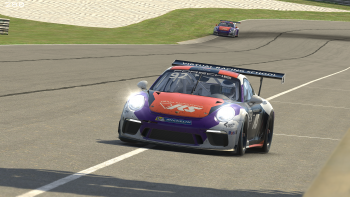 Teien had crashed in front of the leader and was sitting stationary near the top of Turn One when Leahy seemingly did not see the stricken car ahead. Leahy could not avoid contact which caused serious damage to his car and relegated him to a thirty-sixth-place finish. Bobby Zalenski (#83) and Jimmy Mullis (#27) found trouble early as they slide through the front stretch grass after contact. The crash would bring out one of only two yellow flags during the evening as the second half of the 167-lap event went much smoother than the first. The long run let two different pit strategies play out with some drivers choosing to pit an extra time for tires. The short-pitting strategy, usually a safe bet in iRacing, fell short this time as tire falloff was below average. Zack Novak was the highest finishing driver on the two-stop strategy in tenth, more than 18 seconds adrift of Luza. 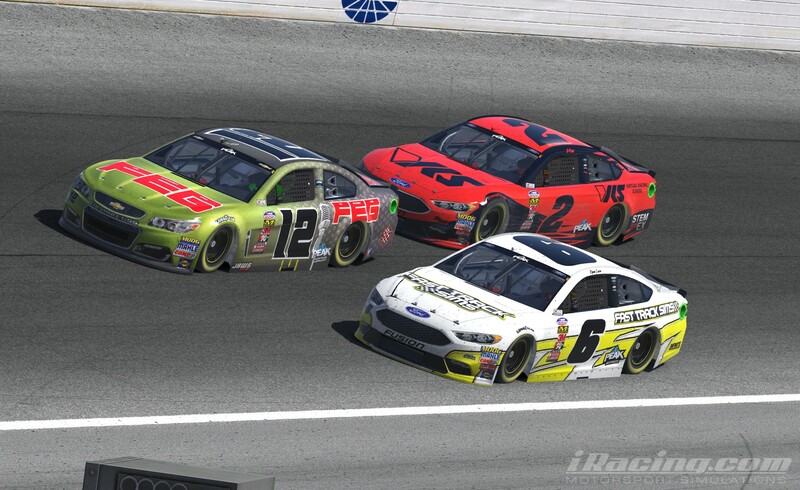 With his back-to-back wins, Luza has closed within three points of the NASCAR PEAK Antifreeze iRacing Series championship lead, as he picked up six points on points leader Alfalla. Leahy’s poor result dropped him to third, 22 off the lead. Michael Conti has quietly worked his way to fourth after notching a top ten, moving in front of Zalenski who completes the front five. 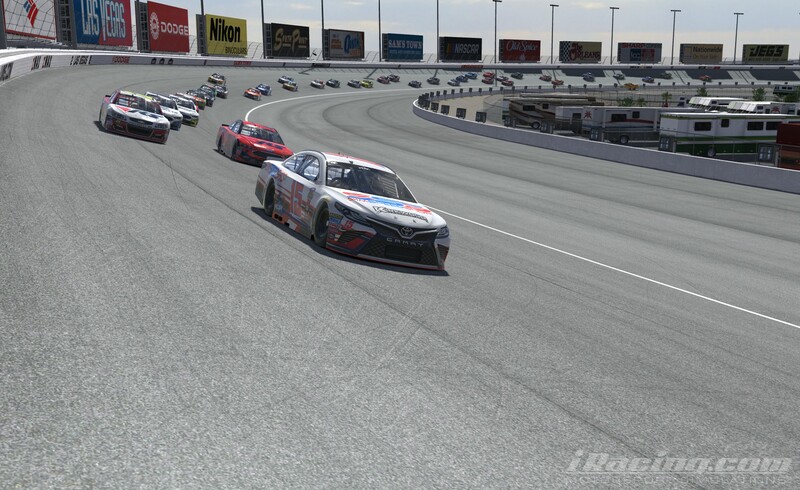 The fifth race of the 2018 season takes the NASCAR PEAK Antifreeze iRacing Series to Richmond Raceway, the first track less than one mile in length. Richmond is always one of the more unpredictable races on the schedule with past events ranging from very clean to caution filled with a double-digit number of yellow flags. Can Luza avoid trouble and make it three wins in a row on his quest for a second straight title? 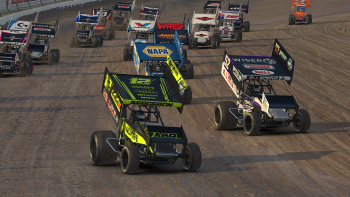 Find out in two weeks on iRacing Live!